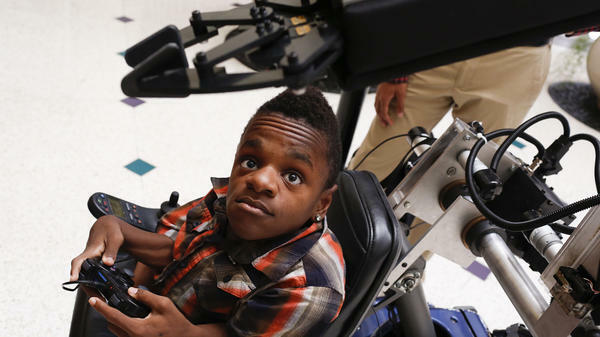 Dee Faught tests a robotic arm installed on his wheelchair in September. 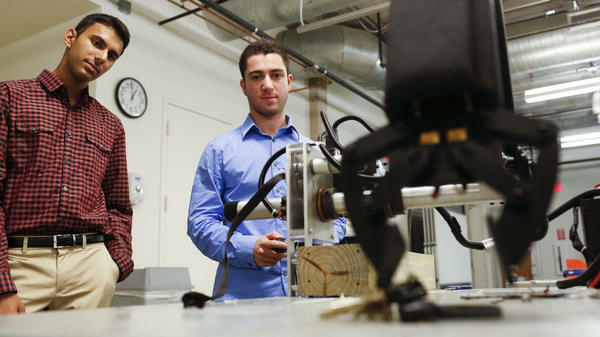 Commercially produced robotic arms can cost tens of thousands of dollars, but three Rice engineering students built one for Dee for about $800. 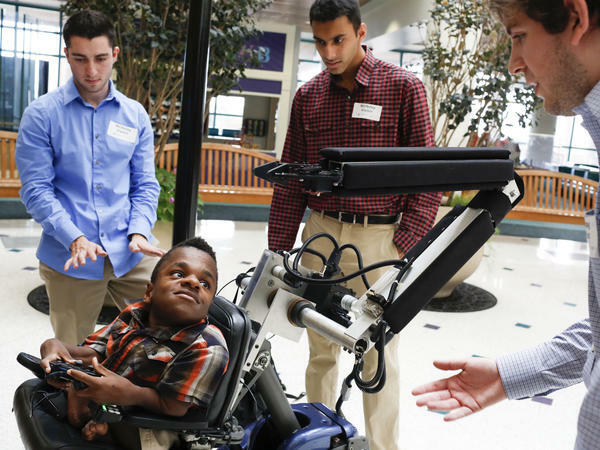 Mittal (left) and Najoomi test a robotic arm they will later install on Dee Faught's wheelchair. Najoomi (from left), Mittal and Sergio Gonzalez started working on the robotic arm two years ago. Gears help move the robotic arm attached to Dee's wheelchair. Three engineering undergrads at Rice University gave a teenager with a rare genetic disease something he'd always wished for: the ability to turn off the light in his room. It may not seem like much, but for 17-year-old Dee Faught, it represents a new kind of independence. Dee can't operate a light switch because he can't reach far enough from his wheelchair. He has a disorder called osteogenesis imperfecta, also known as brittle bone disease. In addition to breaking easily, Dee's bones are tiny. His legs and arms are all twisted up. The team's first step was to meet their client. "We walked through Shriner's Hospital for Children," says Nimish Mittal, one of the trio. "One of the nurses led us to this patient room, and right smack dab there in the center was Dee sitting there in his wheelchair, with just a big smile on his face, waiting to see us." "It was very surprising seeing how small he was at 15 years old at the time," says Matthew Najoomi, the second member of the team. "I guess it was a little bit emotional when we first met him, because we felt bad for him being a teenager. We'd been through that phase. And on top of that, he has to deal with brittle bone disease. And we wanted to do as much as we could to relieve that." At first, Mittal says, they were planning to build him something simple, like a reaching stick of some sort. "But when we met Dee we were all really excited and we said, no, we need to go all out and do the best thing we could possibly do for him," he says. So the team decided to make a portable robotic arm that would attach to Dee's wheelchair so he could reach things all around him. At the end of the arm there would be some kind of gripper Dee could use to pick things up. Rice has a well-equipped lab for engineering students called the Oshman Engineering Design Kitchen where the trio could work on the arm. The project didn't look that hard on paper, but when they actually started building the arm, "We hit a ton of roadblocks," says Sergio Gonzalez, the third member of the trio. "At the beginning we were working on what design we should use for the gripper. Like would it be like a scoop thing? Would it be sort of like this claw? Would it be three prongs? Would it be two prongs? Would it look exactly like a hand and have five digits and clamps around something?" In the end they decided on something that looked like pair of pincers with flat paddles at the end. But there was just one problem: The gripper kept dropping things. "We had to finish something for Dee," says Mittal. "We couldn't honestly leave this project because we would have left Dee hanging." So the class ended, and the team kept going. All the rest of their freshman year, through the summer and the next school year, the trio kept at it. Finally, they cracked the gripper problems. "We changed the materials we used at the end," says Mittal. "We changed the angle at which it was touching the objects; we made it a little bit bigger so there's more contact with the objects that we were picking up." 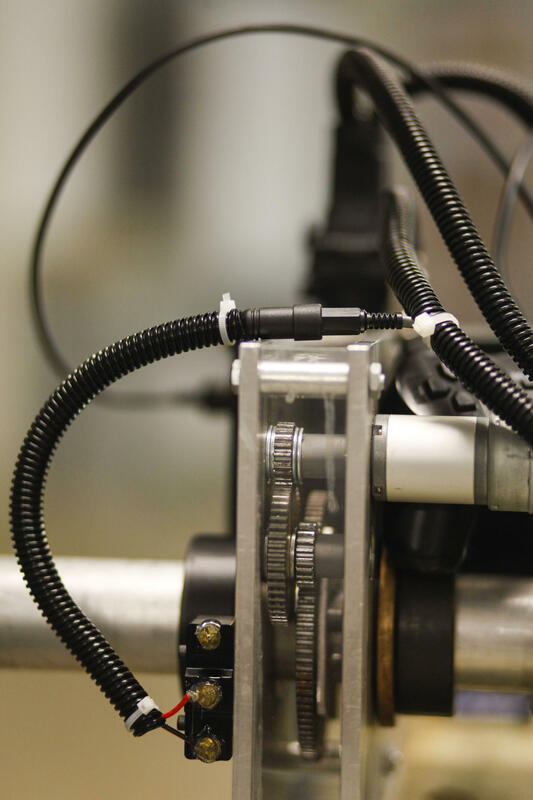 At the end of September, two years after they first got the assignment, Najoomi, Gonzalez and Mittal delivered a working model of the robotic arm to Dee. When the team handed the arm controller to Dee, he got the hang of it right away. "I picked up a towel," says Dee. "I picked up hats, and then I picked up a shirt. And I picked up stuff like a cup, an orange and a book." Just normal stuff. Boring, really, but not for Dee. "It was actually the coolest thing ever." No more will he have to ask for help to turn off the light in his room. For the engineering undergrads, the project could have life-changing consequences, too. "This has definitely refined the engineering I want to do," says Gonzalez. "Because it's an engineering focused on helping people." Mittal agrees. "I definitely want to continue this kind of work throughout my life," he says. "It's been a lot of sacrifice timewise on our end," says Najoomi. But "it pales in comparison to how rewarding it is to see him actually use [the arm] and smile." Not too many students go to college expecting to change someone's life, but that's what happened this fall at Rice University. As part of a series - Joe's Big Idea - NPR's Joe Palca tells us how three engineering students invented a robot arm for a teenage boy that changed his life. In doing so, they may have changed theirs as well. JOE PALCA, BYLINE: This is a story about commitment and persistence, and the reward they can bring. The people in the story include an orthopedic surgeon. DR. GLORIA GOGOLA: Gloria Gogola. PALCA: At Shriners Hospital for Children in Houston. Next, a trio of undergrads. MATTHEW NAJOOMI: My name's Matthew Najoomi. PALCA: He's from Fairfield, Calif., now living in Texas. SERGIO GONZALEZ: My name is Sergio Gonzalez. I'm a bioengineer at Rice University. PALCA: Sergio's from Houston, Texas. And then there's Nimish Mittal. He's not from Texas at all. NIMISH MITTAL: I'm actually from Kansas City. PALCA: And finally, there's a 17-year-old high school senior named Dee Faught. Dee has to use a wheelchair to get around because he has a rare genetic disease. DEE FAUGHT: It's called osteogenesis imperfecta. PALCA: A few years ago, Gloria Gogola began taking care of Dee. GOGOLA: He's got the most severe type of osteogenesis imperfecta that one has and survives birth with. PALCA: Osteogenesis imperfecta is also known as brittle bone disease. The slightest blow can fracture Dee's arm. At 17, his bones are tiny. He's only the size of a 3-year-old. His arms and legs are all twisted up, so he has a hard time doing even the simplest task. He has to ask for help when he wants to turn off the light in his room, or pick up a pencil from his desk. It really bugs Gogola she, herself, can't do more for Dee. But she's a surgeon, and more surgery just won't improve his condition. GOGOLA: And I thought gosh, there's got to be a way to help this guy out with just the basic things, the daily life things. PALCA: And then she thought of something. She'd heard about an unusual freshman course at Rice. Instead of learning from a book, students form teams to find engineering solutions for real-world problems. Maybe the class would form a team to help Dee. Enter our trio of young engineers. Sure, we can help, they said. The team's first step was to meet their client. Here's Nimish. MITTAL: We walked through Shriner's Hospital. One of the nurses led us to this patient room, and we walked in; and right smack dab in the center was Dee; sitting there in his wheelchair, with just a big smile on his face, like waiting to see us. NAJOOMI: It was very surprising, seeing how small he was at 15 years old, at the time. NAJOOMI: I guess it was a little bit emotional when we first met him, because we felt bad for him being a teenager. We'd been through that phase, what it's like. And on top of that, he has to deal with brittle bones disease. And we wanted to do as much as we could to relieve that. MITTAL: We kind of had a conversation with Dee. And it was kind of like at that point, we realized, like, Dee is no different than any of the people on our team - me, Sergio or Matt. He is exactly the same as all of us, you know. He likes Xbox. He likes playing video games. He was talking about his high school. PALCA: Now, Dr. Gogola wasn't expecting the students would build anything elaborate. GOGOLA: I was envisioning a very simple, mechanical type of reaching stick. PALCA: And at first, Nimish says, that's what they were planning to make. MITTAL: But when we met Dee, like, we came back to the drawing board, and we were all really excited. And we went from something really simple - we were like, no, we need to do - we need to go all out and build the best thing that we possibly can for him. PALCA: So the team of freshmen decided to make a portable robotic arm that would attach to Dee's wheelchair so he could reach things all around him. At the end of the arm, there would be some kind of gripper Dee could use to pick things up. GOGOLA: When they first started talking a robotic solution versus just a mechanical reacher, and I talked to Dr. Saterbak, the professor, and said, you know, really? They're really going to get that complicated? And she said, they've got great robotics backgrounds - all of them. These are guys that had spent their high school careers competing in robotics. They have the ability. And I said, well, great. In that case, let's go. PALCA: So they got going. Here's Sergio. GONZALEZ: We hit, actually, a ton of roadblocks. At the beginning, we were working on what design we should use for the gripper. Like, would it be like a little scoop thing? Would it be sort of like this claw? Would it, you know, would it be three prongs? Would it be two prongs? Would it maybe look exactly like a hand - and have five digits - that clamps around something? PALCA: In the end, they decided on something that looks like pair of pincers, with flat paddles at the end. There was just one problem: The gripper kept dropping things. And there was a bigger problem. Dr. Gogola says the arm wasn't nearly finished, but the engineering course was ending. GOGOLA: So as the class starting getting to a close, I started getting a little nervous; thinking if we have nothing to deliver, you know, I don't know how the Rice students will react. But they're fairly young themselves. They may just see this as, well, this is the end of our class, time to move on. But here's going to be a kid on the other end, waiting for it. And I thought to myself, this is a little too - too heart-wrenching for me. PALCA: But Matt and Nimish say the idea of not finishing the project never entered their minds. NAJOOMI: We had someone that came and sat down in front of us and asked for our help. MITTAL: We had to finish something for Dee. We couldn't - we couldn't like, honestly leave this project because we would have left Dee hanging. PALCA: So the class ended, and the team kept going. All the rest of their freshman year, through the summer and the next school year, the trio kept at it. Finally, they cracked the gripper problems. Here's Nimish. MITTAL: We changed the materials we used, at the end. We changed the angle at which it was touching the objects. We made it a little bit bigger so there's more contact with the objects that we were picking up. PALCA: At the end of this past September, two years after they first got the assignment, Matt, Sergio and Nimish delivered a working model of the robotic arm to Dee. PALCA: They call it the R arm. It extends 6 feet. Matt says they used a video game control panel to make it easy for Dee to operate. NAJOOMI: He can rotate the first joint with the action triangle buttons, and then he can rotate the second joint with the up and down buttons. PALCA: Another set of buttons opens and closes the gripper. When the team handed the arm controller to Dee, he got the hang of it right away. FAUGHT: I picked up a towel, and then I picked up hats, and then I picked up a shirt. And I picked up stuff like a cup, an orange and a book. PALCA: Just normal stuff - boring, really, but not for Dee. FAUGHT: It was actually the coolest thing ever. PALCA: The young engineers expect they'll do more tinkering after Dee uses the arm for a while. For orthopedic surgeon Gloria Gogola, the project was an unqualified success, and she hopes it's just the start. GOGOLA: My hidden agenda in all this is to expose these very able-bodied, very intelligent young engineers to the whole field of assistive devices, and things that can help people that are differently abled get along, and do better in their lives. PALCA: When you hear Sergio, Nimish and Matt talk about their project, it seems like her plan is working. GONZALEZ: This has definitely refined the engineering I want to do because it's an engineering focused on helping people. MITTAL: I definitely want to continue this kind of work throughout my life. NAJOOMI: It's been a lot of sacrifice timewise on our end, but I think it pales in comparison to how rewarding it is seeing him actually use it and smile. PALCA: You can see pictures of Dee and his robotic arm on the shots blog on our website, NPR.org.